Suzanne S. Wiley is an editor and writer in Southern California. She has been editing since 1989 and began writing in 2009. Wiley received her master's degree from the University of Texas and her work appears on various websites. Pistachios pop open as they mature. The shell usually splits along a ridge, making opening the shell very simple. Sometimes you find shells that have split open only a little or worse, not at all. This generally means the nut wasn't mature when it was harvested, but that might not stop you from trying to eat the nut anyway if you're hungry enough. Try opening the shell with a nutcracker. Spread a napkin or paper towel out on a counter or table, or place a large plate in front of you. 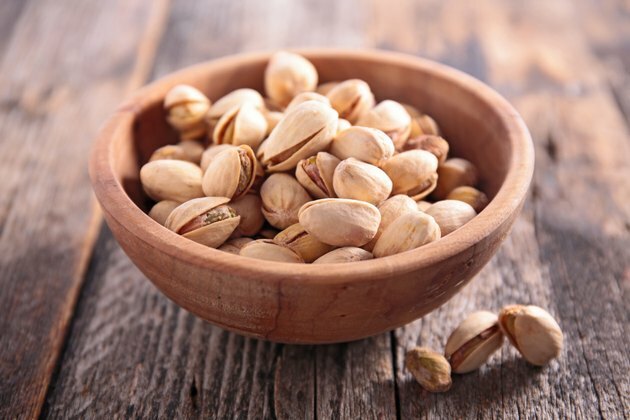 Put the closed pistachio shell in the nutcracker, turning the shell so that the arms of the nutcracker rest along the ridge where the shell would normally open. Start with the arms of the nutcracker at about the midpoint of the side of the shell. Squeeze both arms of the nutcracker, slowly. Stop when the shell cracks open. If you have trouble cracking the nut open, reposition the nut to see whether that makes it easier for the pressure from the nutcracker to force the nut open. The pistachio shell might not pop open neatly. It is possible that the shell will splinter into smaller pieces. If you can’t get the entire shell off, dig the nutmeat out with a nut pick, which is a metal pick that often comes with nutcrackers, or use a skewer to dig inside the shell. Keep in mind that the nutmeat probably won’t be of the best quality because it hasn’t matured sufficiently. Don’t try to crack open the shell with your teeth. If the shell is tough, you’ll just end up with a sore jaw. How Much EPA & DHA Are in Chia Seeds? How Many Calories Are in 1/4 Cup of Unpopped Popcorn?